Specs: Summit elevation: 1500′; Base elevation: 1200′. 4 Lifts: 1 quad, 1 double, 2 surface. Uphill Capacity: 3,200/hr. Terrain Mix: 33-34-33. Longest Run: 2200′. Season: usually December through mid-March. Night Skiing 7 days; Open Saturdays till 3:00 am (Sun). Rentals. Annual Snowfall: 30″. Snowmaking: 100%. The SKInny: Here’s a converted cornfield offering skiing just a stone’s throw from Omaha. Not a bad little hill; a bit crowded in the evenings. Annual pass seems like a decent deal; daily lift ticket prices semi-reasonable. As ski areas go, you know, it’s nicely done…almostfeels like a New England ski area. Specs: 3 Lifts: 1 triple, 2 surface. Terrain Mix: 20-40-40. Uphill capacity: 3600/hr. Longest Run: 1800′. Season: usually December through March. Night Skiing; closed Thurs. nights. Rentals. Annual Snowfall: 30″. Snowmaking: 100%. The SKInny: Well, you know you have to pay the bills somehow. Skiing isn’t exactly a sideline, but we’re not sure it’s the main attraction at Seven Oaks since the only photograph on their website is a bride and groom cutting a cake. Anyway, we like this place: reasonable prices, and a darn decent vertical. If you’re in the area, go. Specs: 3 Lifts: 1 quad, 2 rope tow. Longest Run: 1000′. Season: usually December through March; Weds-Sun plus holidays. Night Skiing. Rentals. Snowmaking. The SKInny: Imagine a water park, except with snow and lots of Des Moines youth trying desperately to be king of the hill. Anyway, the rates are great and the atmosphere is good fun for beginners. Specs: 7 Lifts: 1 quad, 2 triples, 2 doubles, 2 surface. Terrain Mix: 40-40-20. Uphill capacity: 9000/hr. Longest Run: 4000′. Season: usually late November through mid-March. Night Skiing 7 days. Rentals. Annual Snowfall: 45″. Snowmaking: 100%. The SKInny: This is an upside-down (lodge at the top) ski area that — surprisingly — almost looks like aregular ski area such as you might find further east. Trails are cut through a wooded hill that was once an undeveloped buffer between farmland. Fights with Illinois’ Chestnut for the Quad Cities ski dollar; it’s a toss-up. Probably the top ski area in the state. Let’s face it, this sort of vertical is tough to come by in the midwest. If you can catch Sundown on a weekday morning, you’ve got a great day of skiing ahead. Specs: 3 Lifts: 2 j-bars, 1 rope tow. Terrain Mix: 50-34-16 Longest Run: 1,200 ft. Season: CLOSED. The SKInny: Now a “lost” ski area. Nothing troubles me more than to type those words…this was a local “Town tow” community ski area, open when conditions allowed. There are fewer and fewer of these places…I often wonder why more communities don’t support operations like Nor-Ski, and why the communities that have them allow them to fade away. When you see the Nor-Skis of the world, you need to do whatever you can to support these ski areas. Specs: 3 Lifts: 2 t-bars, 1 rope tow. Terrain Mix: 20-40-40. Uphill capacity: 4,800/hr. Longest Run: 2000′. Season: usually December through March; Weds-Sun. Night Skiing. Rentals. Annual Snowfall: 60″. 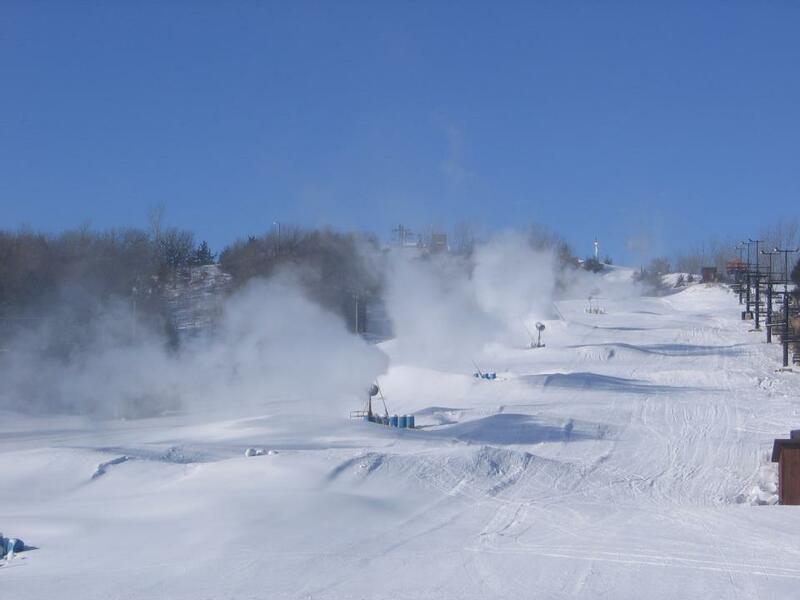 Snowmaking: 100%. The SKInny: Small timey hill for locals; see description for Nor-Ski immediately above. You know, a lot of people from east or west pooh-pooh these little hills, but be assured there are quite a few of us who would love to spend a morning at the Riverside Hills of this world, just to say we were there. Any ski area — no matter how small, no matter how flat — is important and deserves our support in this age of elitist madness.